Every parent has an image in their mind of what their children will be like when they grow up. Being a successful adult starts when children are taught the elements of success from a young age. For example, qualities like love, respect, generosity, care and kindness foster happy and thriving individuals. It may be easy to practise these habits with friends, but much harder to treat new people this… wayeven for adults. But if children are taught these elements early on, these positive habits can become second nature. Creating an awareness of the world from a young age will help children to become considerate and caring adults to those around them.Yara, My Friend from Syria is the first in a series of books that emphasizes on two main goals: The first is to plant good qualities into children's pure hearts, so they may become like fruitful trees as they grow up. 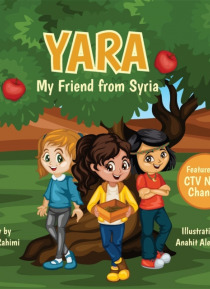 The second is to increase children's awareness of global affairs, which may seem upsetting at times but are the reality of the world around us.This book is about a Syrian girls first day of school in Canada. It depicts her mixed emotions, as she is happy to be in school again but sad to be away from home. The way her new classmates treat her is crucial to her experience.